GreekCuisine.com : Traditional Cooking : Recipe for Baked Spinach with Three Cheeses. Baked Spinach with Three Cheeses. Preheat oven to 325" F. Lightly butter 11x7x2-inch baking dish. Mix first 7 ingredients in large bowl. Heat oil in large pot over medium high heat. Add spinach; saute until wilted and juices evaporate, about 3 minutes. Transfer spinach to strainer over bottom of prepared dish. Sprinkle with cheese mixture. Bake until heated through, about 20 minutes. 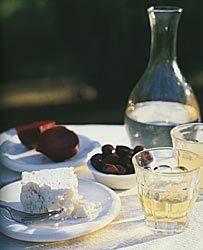 Source:From Palia Istoria (Rhodes, Greece), a popular restaurant devoted entirely to mezedes, or starters.